Following up on our first report, here is the promised update about where we stand with our participatory grantmaking efforts. The six prototypes that had been developed in Seville were carefully analysed and distilled into one. 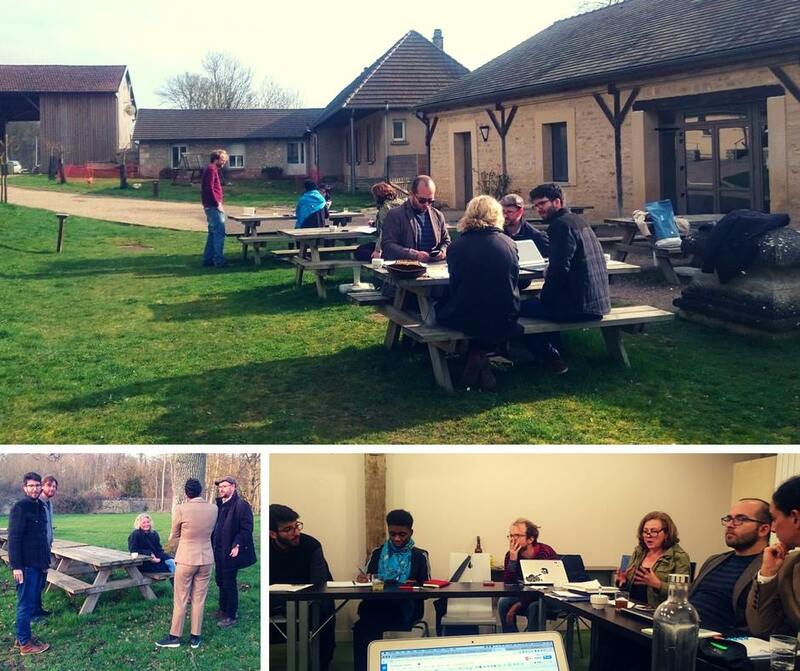 An intense 3-day gathering in early March in La Bergerie, close to Paris, brought together a smaller group of activists and foundation representatives as well as Cynthia Gibson, a grantmaking consultant from the US. The activists involved, had been nominated by the larger group in Seville to continue this building process in their name. At that meeting, we fleshed out the details of the prototype, particularly with respect to governance, grant types and the grant giving process. The output is an ambitious plan to set up the fund and test-run three types of grants (fast response, systemic change and exchange & capacity building) before the end of this year. Until today, a preliminary Facilitation Group was formed as the core governance body of the fund and platform. Three peer-to-peer grantmaking panels will be determined for each type of grant. An annual gathering will bring together the community we hope to build around the fund and is planned for January 2018. At the Guerrilla Foundation, we got involved in this project because we see this process as a great opportunity to explore a radically different way of grantmaking and as a first step to seeing philanthropic capital as a common good rather than a private resource. This is an unimaginable framework for many foundations if you consider the consequences, namely full ownership of the fund by those who would traditionally be passive recipients. The philanthropic sector is still very far from abolishing itself. On the one hand, the key challenge at the moment seems to be how to avoid tokenism, only giving a tiny fraction of one’s budget into a participatory fund while the majority of grants are being made in a way that maintains the traditional power balance. On the other hand, there is the question of attracting more funders to this initiative. How do you attract more institutional and individual funders to a project that eventually will challenge their very power, influence and existence? The answer is somewhere in between and lies in setting up a highly effective mechanism to address the needs of activists more directly while increasing the accountability of funders vis-a-vis those receiving the money. This should be attractive to many genuine philanthropists but also is just an idea and a hope that we still need to prove in practice. What are the challenges and the way ahead? As our goal of announcing the project at the EDGE Funders Alliance Annual Conference rapidly approaches, a couple of things need sorting out so that we are able to run our prototype. To pick up on the thread above, we need to formulate a clear question and set of indicators that will help us to determine the success of our prototype. We want to know whether and how our version of participatory grantmaking is ‘better’ than traditional approaches in order to justify going ahead with this approach in 2018 and beyond. What are the indicators we can use to reliably test this assumption? Alongside this crucial issue, a lot of nitty gritty details still need to be figured out, starting with a name for the whole endeavour (ideas, anyone?). Another question we have yet to solve is how to fairly compensate those activists who serve on the Facilitation groups and peer-to-peer grantmaking panels? Given that activists are spread across Europe, with very different costs of living, a flat fee seems unsuitable. But how do we avoid an administrative nightmare in which fees are individually set depending on the country of residence of any given activist? Our key practical challenge at the moment seems to be effective two-way communication. Involving and relaying relevant information and regular updates to everyone who has been part of the process is proving to be tough. Shared folders and emails abound, the challenge lies in picking and implementing suitable tools from the beginning and diffusing them throughout the entire group. Discussions about data security and skepticism towards Google and Facebook aside, how inclusive are we when Slack is the tool you have to have mastered to be a part of the process? What is more, we urgently need to define the way in which our grantmaking process and peer-to-peer decision-making panels will function under conditions where face-to-face meetings, the basis of many participatory grantmaking efforts, are not feasible. What technical tools are out there and how could they be useful? A very specific blog post on this topic looms on the horizon. Especially in the beginning, there will be a lot of goodwill required from everyone involved to grease the squeaky hinges of our prototype. However, the feeling of being a part of something unique, that has the potential to contribute to a paradigm shift in philanthropy, is intensely motivating and helps to overlook update delays or work duplications due to (currently) inefficient communication. But we’re maintaining the mantra that every great birth has its birthing pains.